Millionaire Jimi Heselden, owner of the Segway company, has died after falling from cliffs while riding one of the scooters. Heselden, 62, crashed into the River Wharfe while riding the Segway round his estate in Thorp Arch in West Yorkshire in England, on Sunday. He was pronounced dead at the scene. 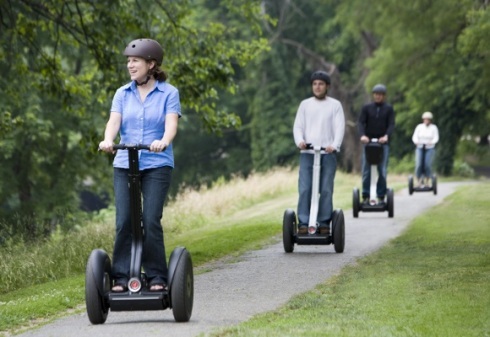 Over 50,000 Segways have been sold since the vehicles launch in 2001. Mr Heselden, founder of Hesco Bastion, acquired the Segway operation in December 2009. In 2009 Mr Heselden, who leaves a wife and children, led a British team which bought the United States-based Segway firm. invented by Dean Kamen and unveiled in 2001. The tycoon was well known for his donations to charity, giving more than £20m to good causes. As a spokesman for Hesco Bastion said: “Jimi is perhaps best known for his charity work with Help for Heroes and the Leeds Community Foundation. Speaking in 2009, a spokesman for Segway said that the company had sold over 50,000 vehicles. The Segway, which can reach speeds of 20kph, have been the subject of much media attention and restrictions have been placed on their use in several countries due to concerns over pedestrian safety. They have been used by police around the world, including specially-trained officers at the 2008 Summer Olympics. The scooters are available for rent for city tours across Europe, including Vienna and Prague. In Ireland, they can be rented for tours around Dublin’s Phoenix Park.